It’s never an easy task for any parent to bring a baby or toddler out. Not to mention if you’re the parent to a baby AND a toddler. Which strollers suit your needs of keeping a sleeping baby and a fussy toddler together? But what happens if your baby and toddler have a wider age gap of 3 – 5 years? This is when you need a sit and stand stroller! Or what some would call, a one and half stroller. Your baby will probably need a stroller or infant seat to sleep in while your older toddler should be eager and able to walk well by now. However, the older toddler do get tired occasionally and need a rest, or risk turning grouchy. Yet at the same time, it would probably be very hard to get the 3 – 5 year olds strapped in a stroller for a pro-longed period of time. It’s the age where they are trying to exercise independence. Moreover, like all fussy and fickle toddlers, one minute they want to be walking on their own and the next minute they want to be in the stroller (just like their younger sibling). What Is A Sit And Stand Stroller? What Are The Pros And Cons Of Using A Sit And Stand Stroller? What To Look Out For In A Sit And Stand Stroller? What’s Great About The Joovy Caboose Ultralight Graphite Sit And Stand Stroller? What Accessories Can I Get For The Caboose Ultralight Graphite? What Other Sit And Stand Options Does Joovy Offer? What Are Customers Saying About Joovy Caboose Ultralight Graphite? What’s Great About The Baby Trend Sit N’ Stand Ultra Stroller? What Other Sit and Stand Options Does Baby Trend Offer? 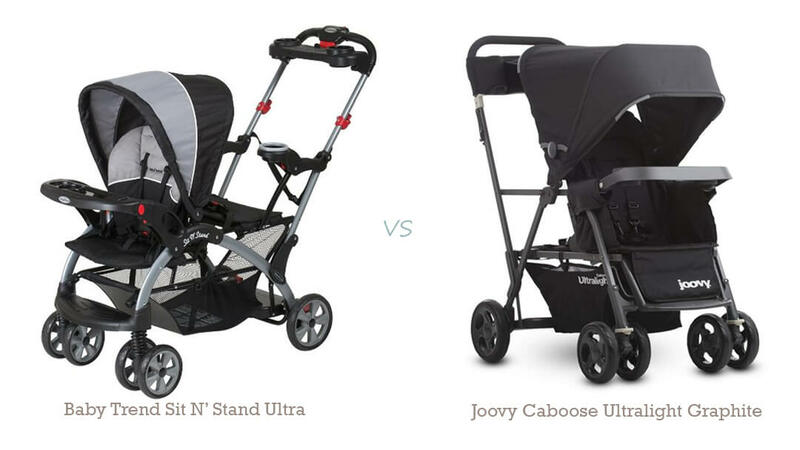 Should I Buy The Joovy Caboose Ultralight Graphite or Baby Trend Sit N’ Stand Ultra Stroller, And Where Can I Get One? A double stroller would be too bulky and heavy, considering that the older toddler will not be spending so much time in the stroller. Using a standard stroller along with a lightweight umbrella stroller only works if you have another adult along to help you. In essence, this type of tandem stroller has a regular stroller seat at the front, which is also compatible with an infant car seat. The rear of the sit and stand stroller is a standing platform and a small bench for the older child to hitch a ride by either standing or seated. It gives more freedom and independence to your older toddler, while reducing the bulk (and weight) of a full-fledge double stroller. Your older child will enjoy the ride better as he has the option of sitting facing dear mommy, or standing (facing forward or backward). They will feel like a big kid, compared to being strapped onto a stroller along with their younger sibling. Before we go into the review of the various models, let’s first review the pros and cons of this type of strollers in general. This category of strollers are generally lighter and more compact compared to a full-fledged double stroller as you’re missing one extra seat after all. Hence it is easier to maneuver and haul it into/out of the car boot. It’s much easier navigating through crowds in shopping centers or theme parks, compared to a full double stroller. Most stand and sit strollers have 1 main stroller seat which is compatible with infant car seats so that they can be used for newborns. The older toddler remains independent and enjoys the freedom to walk, stand or sit. He/She can walk alongside the stroller until the little legs get tired, or when his or her tantrums swing by, which isn’t uncommon… You can also avoid losing your child in crowded places as you can easily ask your child to scoot up for a ride, for fear that the highly distractible toddler strays off. If you have kids, you will understand just how much gear you need to pack along, even for a simple outing. Hence you will be pleased to know that the storage baskets are generally large for these stand and stand strollers. The wheels of sit-and-stand strollers are usually smaller and has little suspension (which is a compromise for most lightweight strollers anyway). It works well if you are a city dweller and using it for everyday activities including running errands around the town and walking on concrete sidewalks or shopping centers. However, it is definitely not designed to handle off the beat road and rough terrains, (grass, gravel) especially when it’s weighed down by 2 kids. TIP: Many parents overcome this problem by having both an all-terrain stroller and a sit n stand stroller, and alternating between the 2 depending on the nature of the trip. Sit and stand strollers are generally not too expensive, so you can consider buying it as a spare stroller. When using an infant car seat in the front, it eats into the space at the back for the older kid. While it is ok if your older kid is standing, it may be too tight for the rear rider to be seated comfortably when it’s used in conjunction with the infant car seat. If your older child needs to be seated comfortably for longer periods of time, you might want to look out for models with an optional full-fledged stroller seat. Your youngest one will be well protected by the attached sun canopy of the stroller, but there is no sun protection for the standing child. Weight and size – How easy it is to haul into/out of the car trunks or use it on the public transportation? How is the maneuverability and how smooth the push is? Combined weight capacity of over 70 Ibs, as you need to carry 2 kids. Fabric that can withstand spills and is easy to clean. The standing platform should have enough room to stand steady, with a place for your child to hold onto while standing up. Sun protection – Is the sun canopy large enough to provide sufficient coverage? Does it have one or two canopies? Ample storage space such as a large basket, parent console and cup holder. Is the sit n stand stroller travel system compatible so that you can start using the stroller as early as a newborn? Can it be fitted with infant car seats easily? 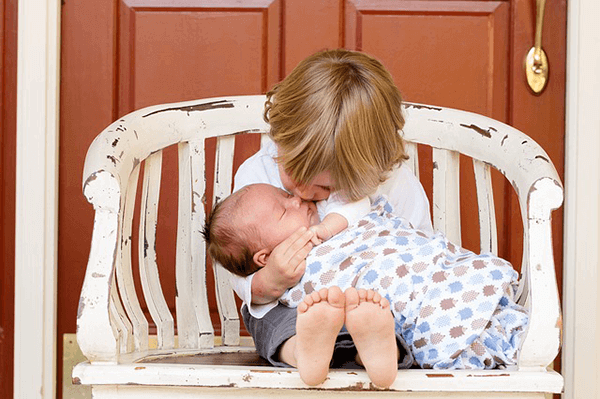 Comfort and space – Will both of your children be comfortable in the stroller? Are the seats padded? Can the seat be reclined to accommodate a napping baby? Is there an adjustable footrest? Does the stroller wheels have a suspension system to smoothen the bumps? Price – With such a huge range of strollers available over a wide price range, it is best to first set your budget and shortlist the strollers that best fit your needs and budget. We’ve researched and analyzed ALL the sit and stand strollers from different brands, and identified the 2 BEST ones, so that you don’t have to! The rest of the article will be about our reviews of the 2 best sit and stand strollers, and why we think they deserve to be the cream of the crop among so many other different options. The reason we’ve selected 2 models is because of the different price range, so there’s always a best option no matter which budget you’re on. Joovy Caboose Ultralight Graphite is 2016’s latest update to the all-time favorite Joovy Caboose Ultralight Stroller. The main upgrades include a lean graphite-colored aluminium frame, which shaved off 10% of the weight from the previous Joovy Caboose Ultralight version. This latest version includes a rear canopy extension from the parent console to provide some sun protection for our little rider at the back. Almost all other sit and stand strollers have only a single canopy for the front seat. 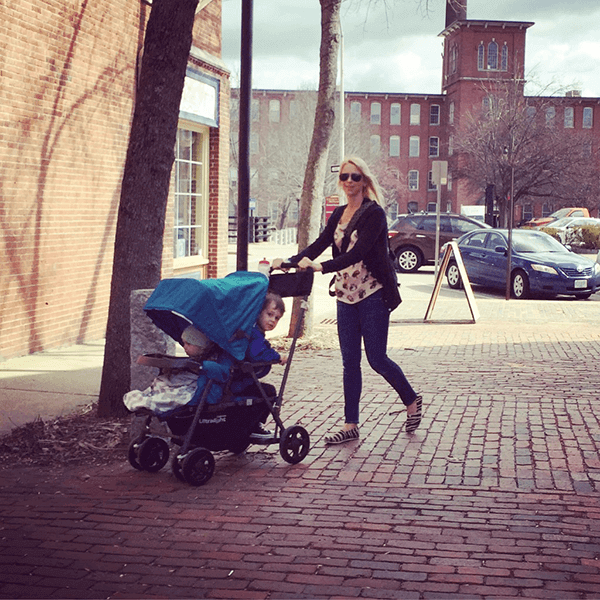 Joovy Caboose Ultralight Graphite is more pricey but it is probably the lightest, most maneuverable stroller in the category of stand and ride strollers. Their strollers are well designed and constructed, and offers many trendy colors. At only 22 Ibs, the Caboose Ultralight Graphite weighs far less than most double strollers. Even with the snack tray, parent organizer and sun canopy attached, the total weight is just 24 lbs. It is also far shorter than other brands, and is barely larger than a single stroller. This extremely lightweight and compact design makes it so much easier to maneuver compared to others. It navigates easily through crowds and tight spaces, which is great for running errands around the towns, shopping at busy shopping centers or even a family day at a crowded theme parks. This Joovy stroller makes use of lightweight metal (aircraft grade aluminium), which makes it more sturdy compared to the plastics used by most others. This stroller features a 4-wheel suspension system and sealed bearing wheels to offer your kids a smoother ride. However, there’s been complaints by some customers that the wheels occasionally squeak. A silicon spray will probably fix this issue. The Joovy Caboose Ultralight Graphite folds up to a size of 10.5 x 21.5 x 41.5 inches, which is as compact as a single stroller. It will fit into smaller car trunks such as the Chevy Malibu or Toyota Prius and wouldn’t give much trouble if you’re using the public transportation. The fold is very easy but it is a 2-hand fold though. Simply collapse the canopy and push it forward, put the front seat in the most upright position, lock the front wheels and brakes, unlock the safety latch on the lower left side of the stroller, then pull upwards on the two white levers (folding mechanisms) just below each side of the handlebar and push the handle forward. Finally latch the fold lock on the right side of the stroller to hold everything in place. You can remove the sun canopy to make it more compact. The stroller can also be folded with the seat adapter connected, but that will add another 4½ inches to the folded length. The front seat, rear sitting bench and standing platform have a maximum weight capacity of 45 Ibs each (combined 90 Ibs weight limit for the stroller). Both the seat and bench are padded to make the rides comfortable for both of our little riders. The front seat has an adjustable 5-point harness, while the rear bench also features a 3-point harness so you can have a peace of mind when your older child is seated. When your little rear rider is seated, the rear bench should be pushed all the way in (hence closing the access to the storage basket) and there is a locking strap velcro’ed to the bottom of the bench to prevent it from sliding. 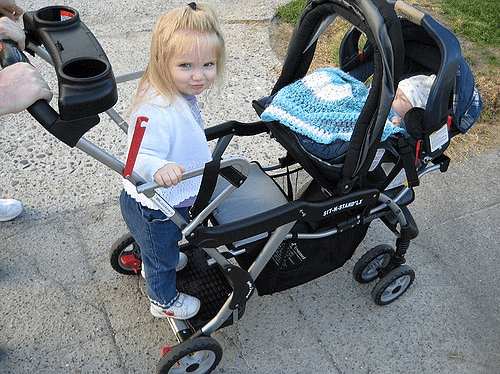 For safety, both of the child’s feet should be fully perched on the standing platform and both hands should be holding onto the stroller frame. The front seat features a 3-position recline. You can recline the front seat to the lowest position when your baby is napping, and there’s still sufficient space for your older child to stand on the platform at the back. However, you probably won’t be able to recline the front seat beyond the 2nd position in order to let your rear rider sit comfortably on the bench. The front seat may not be the biggest seat, but with the seatback at 16½”, it is probably around the average size. What’s nice is that the footrest is adjustable so that smaller babies still have the leg support even when reclined for a nap. If your older toddler is less than 2.5 years old and not quite mature enough to be standing at the rear platform, it is recommended that you purchase a second seat known as the Caboose Too. The Caboose Too rear seat is installed on top of the rear bench to give you 2 full-sized reclining seats. This is great if you are using the Joovy Caboose stroller for long excursions and need the rear rider to sit comfortably for a long period of time. Without the Caboose Too seat, this Joovy Caboose is more of a hop on/hop off stroller. The Caboose Too seat has a weight capacity of 45 Ibs, a 5-point harness and is able to recline (though it can’t recline as deeply as the front seat). However, the downside of using this as a full double stroller is that the parent console will just be a few inches above your rear sitting child’s head. You will have to think twice about putting ANY hot beverages or spill-able drinks into your parent console. Bottles and sippy cups are fine. Also note that the child at the back won’t have his own cup holder or snack tray like the front seat. Not a real deal breaker to me though. You can easily turn the Ultralight Caboose Graphite into a travel system so you can start using the stroller as early as from birth (with the infant car seat). Otherwise, the front seat is suitable for babies from 3+ months and rear bench/standing platform for toddlers above 2.5 years old. The stroller comes with a universal car seat adapter that clicks easily into the end of the arm rests of the front seat, where you can otherwise attach the snack tray. When not in use, the safety straps that secure the infant seat in place can be kept neatly in the little pockets on both sides of the seat. It is compatible with car seats including Baby Trend, Britax, Chicco, Combi, Evenflo, Graco, Maxi-Cosi, Peg Perego, and Safety 1st. (You can check out the complete list of compatible car seats on Joovy’s website). With the infant car seat, there’s still room for your rear rider to stand on the stand-on platform. However, the infant seat takes up a lot of space from the older child sitting in the back as the front seat will need to be reclined to the middle position. If your older child needs to sit for a long period of time while your younger one is in the car seat, you might want to consider the Caboose Too seat. The stand-on platform is built-in so that it is not wobbly and unstable (compared to strollers where you attach extra stroller boards). Your little rear rider can also hold onto the sturdy metal handles while seated or standing. 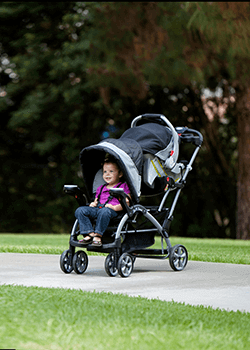 This model features an oversized sun canopy and pull-out sun visor for the front, which is almost unmatched by other strollers. The sun canopy fits over both kids and can be adjusted forward or backwards to provide some sun coverage for the rear rider (but honestly, the coverage is better for the front seat). Most stand and sit strollers only have ONE canopy for the front seat, which means the older child has no canopy to protect him from the sun. However, Joovy has introduced the latest model with the rear rider in mind! The rear canopy attachment has been added to provide more shade for the child when seated on the rear bench. It can be unzipped, folded, and stored in the pocket of the parent organizer when not in use. The canopy is also made of a reflective material, which is awesome for late strolls. The Joovy Caboose Ultralight Graphite comes with a fabulous parent organizer. It features a rear zippered pocket, which is great for storing and quick access of your keys, mobile phone and more, as well as a large open pocket and dual cup holders in the front. The organizer is made of neoprene, which is machine-washable and helps maintain the temperature of your beverages. It also has a large storage basket underneath to accommodate all your necessities. It is probably big enough to store a diaper bag and a pre-schooler backpack. Supposedly you can access the basket from the rear, sides and through the top opening by sliding the rear bench forward. Cons: However, it does become difficult and awkward to access the basket when the older child is seated in the rear seat. A nice little touch is that there are mesh pockets at the sides of the storage basket to keep the smaller items. When your baby is old enough to move from the car seat to the stroller seat, simply remove the car seat adapter and replace it with the snack tray. The snack tray (which comes free!) has two cup holders and a depression in the centre for snacks or little toys. This Joovy Caboose Sit and Stand stroller features linked rear brakes. This means that you only have to step on the foot brakes once (NOT one on each side) to fully stop the stroller. This is more convenient and safer than most strollers with foot brakes which require you to step on the foot brake pedals on both sides of the stroller. Joovy started as a family-owned company and even as it grows, many customers continue to praise them for their superb customer service and fast response when you bother to give them a call. 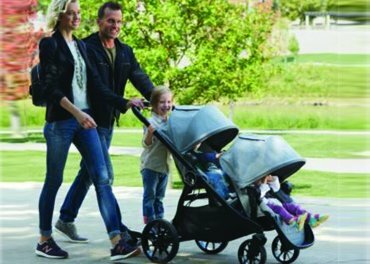 The strollers are backed by a 2 year warranty and you can trust that the customer service team is more than happy to help you with any problems you might have. The raincover is sold separately, and is customized for the different models. The raincover is very handy and easy to install, protecting both children from rain and wind. It is ventilated for breathability and features a convenient front opening so that you can pass items (such as bottles or snacks) to the child without having to remove or lift the cover. It comes in 4 trendy colors – Black, Red, Citron and Turq. Joovy also offers a pricier and more luxurious model – the VaryLight Sit And Stand Stroller. This stroller is able to handle more terrains because of the larger rear wheels and the 4-wheel suspension (but it is still not an all-terrain stroller). It features a telescoping frame that allows you to vary the stroller from a shorter and more compact mode for better maneuverability, to a longer and more roomy mode for greater leg space for the rear sitting child. This is suitable if you are using the infant car seat and your older child still needs to sit comfortably for long periods of time. VaryLight also offers the option and flexibility of placing the infant car seat in the front or rear. The downside is that it is much heavier. The infant seat adapter has to be purchased separately as it needs to match the specific brand of car seat (which may actually be a good thing as the car seat will fit more snugly compared to using the universal adapter on the Ultralight Graphite). In case you didn’t know, the sit and stand stroller concept was started by Baby Trend years ago and they continued to introduce many outstanding models. The Sit N Stand Ultra stroller is recommended for its versatility and more affordable price range. It is better suited if you have younger children closer in age, as it offers the flexibility of placing the infant car seat in the front or rear seat. On the downside, this stroller is longer and more front heavy (especially when your older child is seated in front) compared to Joovy, hence it’s a tad harder to maneuver. The front and rear seat each has a weight limit of 50 Ibs. Given that the average child doesn’t reach 50 lbs until 6 years of age, it means that you can safely use this stroller for many years to come. For a basic entry-level sit and stand, this stroller has pretty decent suspension that makes it easy to push even when t’s fully loaded with 2 kids. This Baby Trend stand and sit stroller offers more seating options since the car seat can be snapped into the front or rear seat. Your older toddler will have the full options of holding and walking alongside the stroller, hitching a ride by standing on the rear platform or sitting on the rear bench like a “big kid”, and even sitting in the front seat on days when he feel like being “the baby” or when he’s too tired and needs a quick nap. Putting the infant car seat in the back allows for closer interaction between you and your baby and ensures that your older child can sit more comfortably in the front seat. Such arrangement would be better for kids with a smaller age gap, such as an infant and a 2 year old. The front seat might be a little cramped for a child older than 3. As your kids grow, you can switch the seating arrangement effortlessly. Once your oldest child is ready to use the sit and stand section at the rear, your infant can be moved to the front, either in a car seat, or in the regular seat when the infant seat has been outgrown. What I like about this is that you do not have to take anything apart. All you need to do is to press a button and fold the tray down to turn it into the base for the car seat. Similar to Joovy, the front seat can be reclined to a near flat position to allow your napping toddler to sleep more comfortably. However, this will eat into the space of the rear rider making it too tight to sit at the back. Standing, on the other hand, will not be a problem. The Sit N’ Stand Ultra also features a 5-point safety harness for the front stroller seat and a 3-point harness on the rear platform seat, so that you’ll have a peace of mind knowing that your little ones are safely secured while you’re on the move. Cons: The 5 point harness is not padded so the hard plastic parts may be uncomfortable. You might need to add strap cover yourself. Hopefully, the harness will be padded in newer versions. Moreover, if your older child is standing at the rear standing board, there’s an additional harness at the back that you can latch behind your standing child to prevent them from falling backwards. The sun canopy is decently sized, providing adequate sun protection for the rider in the front seat. Cons: Unlike Joovy, it does not have additional sun shade for the rear rider. The folding mechanism of the stroller is very well designed and it folds down flat for compact storage. The folding is easy enough to do with one hand, but it won’t stand on its own. So, you will still need both hands to latch and lift it. Note: The front wheels need to be positioned just right, else the stroller will not fold. It’s not an issue most of the time but it can be annoying on occasions when the wheels are not in the proper position. The Sit N Stand Ultra has a plastic parent tray located just below the handle bar, which comprises of 2 drink (or snack) holders and a compartment with a plastic lid for you to store items such as your phone and keys safely and within easy reach. Cons: The only thing to be careful with this plastic console is that if your older child leaned too hard on it, it might popped off. It also has a total of 5 cup holders! This is probably the most I have seen…There’s 2 on either side of the parent console, 1 on the snack tray and 2 independent drink holders (one for each side) that can be moved between the front and back seating position of the Sit N Stand. The snack tray and the 2 drink holders can be removed and moved interchangeably between the front and back seating positions. Beneath the stroller seats is a large storage basket which should have sufficient space for you to throw in all the stuff you need for a day out with 2 kids. Cons: Similar to the problem faced in Joovy, the access to the storage basket is largely from the rear seat (especially if you are putting in or removing large items). Hence, it can be awkward and difficult to access the basket if you have a child at the rear bench or using a car seat at the rear. The front swivel wheels are very flexible and able to make a 360 degree turn swiftly, hence improving its maneuverability. But they can also be locked for greater stability when charging through rougher terrains. The fabric used for the stroller is easy to clean. All you need is mild detergent, warm water and a piece of cloth or sponge. Baby Trend’s website features as many as 15 colors. However, not all styles are available at all stores. The 2 popular colors carried by Amazon include Phantom and Elixer. The Ultra does not come with an optional double/second seat. 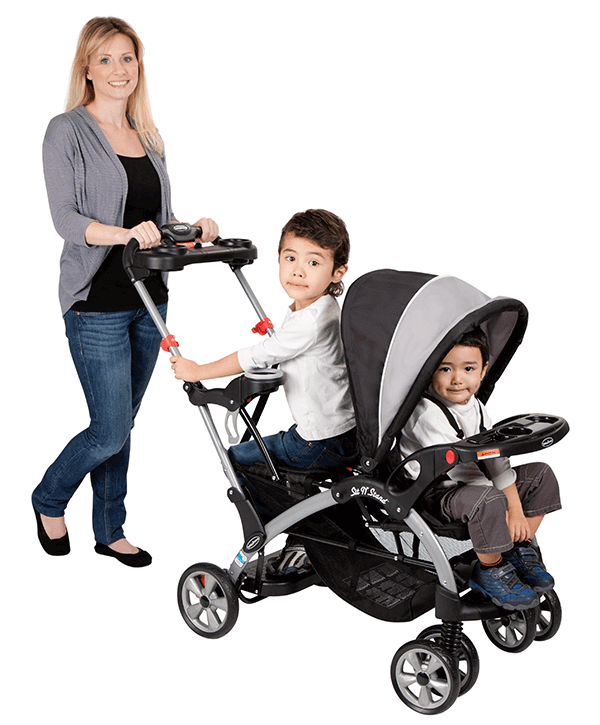 Hence, if you expect that your older child will need a full-sized seat with canopy to sit comfortably for a long period of time (after your first child outgrows the infant car seat), you might want to consider Baby Trend’s regular tandem double stroller which can also be converted into a sit and stand stroller. With such a wide variety of stroller models in the market today, it can be painfully confusing to decide on the RIGHT stroller. The FIRST step you should do is to identify your budget so that you can shortlist and select the ones that best meet your needs while not straining your finances. For the category of Sit and Stand Strollers, we recommend the Baby Trend Sit N’ Stand Ultra for its versatility and affordable price range and the Joovy Caboose Ultralight Graphite if you have a bigger budget to spare. It may be more pricey, but it is lighter, well-constructed and even features a second canopy for the rear rider. Just bear in mind that that sit and stand strollers are not all-terrain strollers. Happy New Year 2019! And Saying Goodbye to 2018.